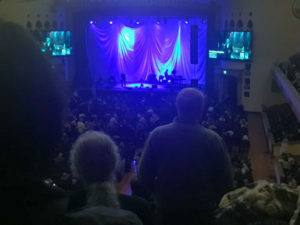 Venue remodeled in 2012, capacity is 2850. HC seating is in the front row on the floor. We have not sat there, but you will be looking up to see the stage. There is other HC seating at the top row of the balcony. These seats have no extra elevation between them and the row in front. If everyone sits, you can see. If the people in the row in front of you stand, then you cannot see the stage. Staff is very helpful and accommodating.